It’s a hard decision to give up the game you love, but it’s one that redshirt junior defensive lineman Sam Kamp had to make. With one year of football eligibility left, Kamp has decided to forgo his senior year and retire from football. He will graduate in the spring with a double major. Kamp was a three-year backup with the Ducks, totaling 33 tackles in his career — including 20 this season playing in the second defensive line unit. With Arik Armstead leaving early for the NFL Draft, the loss of Kamp will surely hurt the Oregon defense in terms of depth, but his decision was much bigger than football. Kamp had a career-high 20 tackles this past season. The additional weight put strain on Kamp’s body. 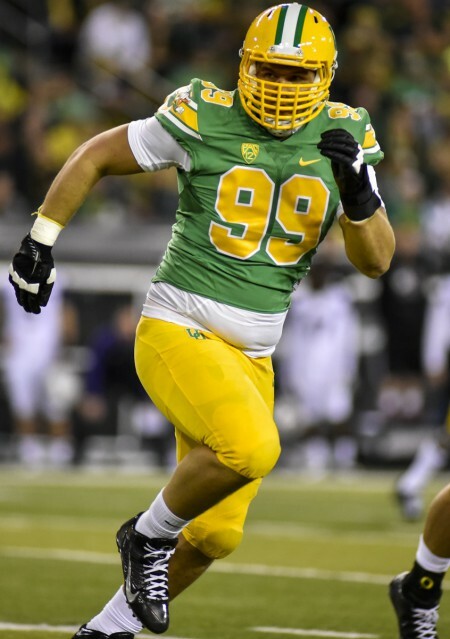 Playing at 292 pounds, the Oregon lineman is the heaviest he’s ever been, and he’s in constant pain. When asked about getting the playing weight off in later years, Kamp acknowledged that it is often very difficult for linemen to lose the weight. As someone who has lost roughly 100 pounds myself, I can relate to his health-conscious decision. Since the national championship game January 12, Kamp has already slimmed down to 270 pounds and plans to graduate this spring at a lean 225 pounds. Hopefully the weight loss will make Kamp a much happier and healthier individual moving forward in his life. We must remember, there is much more to life than football, and when the playing days end, life goes on. It seems Kamp has realized that at a young age, and I applaud him for that. The loss of a big, talented and experienced lineman will hurt the Ducks next year, but with the stellar recruiting class Oregon is building, the loss of Kamp will be alleviated. Losing weight is a hard task, and giving up the sport you love and the sport that put you through school is even harder, but we can wish him nothing but the best moving forward with his new journey. Once a Duck, always a Duck.